Over 60% Off New - Refurbished TI-Nspire EZ Spot Yellow Handheld with Touchpad Teacher Kit (10pack) - Includes 6-month in house warranty. We only have 3 packs left and these will be SOLD OUT FAST. Get yours before they are gone, again. We are clearing out our final stock of these items at a MASSIVE discount - call us at 800-805-3392 if you have any questions or send us a Purchase Order directly. We only have 21 sets of 10 left on these items before we sell out at this incredible price for the TI-Nspire EZ Spot Handheld Touchpads. See multiple representations of a single problem - algebraic, graphical, geometric, numeric and written. Save and review work - create, edit and save problem solving in documents and pages similar to the word processing and file storage features of a computer. CALCULATOR - Enter and view expressions, equations and formulas exactly as they appear in math textbooks. Quickly and easily select the proper syntax, symbols and variables from a template that supports standard mathematical notation. Scroll through previous entries to explore outcomes and patterns. GRAPHS – Graph and explore functions, animate points on objects or graphs and explain their behavior, and much more. GEOMETRY – Create and explore geometric shapes. LISTS & SPREADSHEET - Capture and track the values of a graph and collected data, and observe number patterns. Organize the results of statistical analysis. Capabilities similar to using computer spreadsheets: label columns, insert formulas into cells, select individual cells and change their size, and more. DATA & STATISTICS - Summarize statistical data using different graphical methods. Manipulate and explore data - watch how changes in data can affect the statistical analysis. Create "quick graphs". Perform a variety of descriptive and inferential statistical calculations on real data sets. NOTES - Put the math in writing. Include the word problem with its solutions and explain problem-solving approaches - right in the handheld or computer software. Question-and-answer templates allow educators to prompt students to show solutions. Connect the TI-Nspire ViewScreen Panel to any TI-Nspire handheld for use with an overhead projector. School purchases include: 30-day money back guarantee and 1-year warranty on purchases. 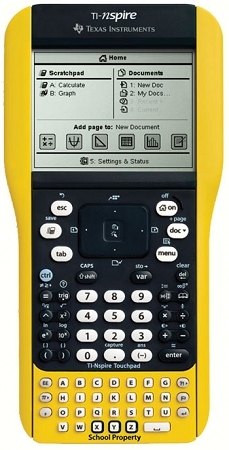 I ordered 100 refurbished TI-Nspire calculators. They all arrived securely packaged and in excellent condition. It is difficult to tell that most of them have ever been used. Great products, prices, and customer service.